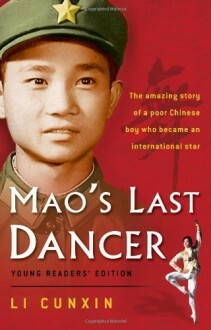 At the age of eleven, Li Cunxin was one of the privileged few selected to serve in Chairman Mao’s Cultural Revolution by studying at the Beijing Dance Academy. Having known bitter poverty in his rural China home, ballet would be his family’s best chance for a better future. From one hardship to another, Cunxin demonstrated perseverance and an appetite for success that led him to be chosen as one of the first two people to leave Mao’s China and go to American to dance on a special cultural exchange. But life in the U.S. was nothing like his communist indoctrination had led him to believe. Ultimately, he defected to the west in a dramatic media storm, and went on to dance with the Houston Ballet for sixteen years. This inspiring story of passion, resilience, and a family’s love captures the harsh reality of life in Mao’s communist China and the exciting world of professional dance. This compelling memoir includes photos documenting Li’s extraordinary life. I really enjoyed the first 2 thirds of this book. It well written, gripping, interesting, etc. But the last thrid of the book he starts repeating himself and I just wanted to get it over with. Pity though, because it is a wonderful story!